Image courtesy of Étienne Artigau. Imagine two tennis balls separated by 180 miles--yet still in orbit around each other. That's an accurate scale model for a remarkable pair of red stars which astronomers have discovered in the constellation Phoenix. The double star is the widest very low mass binary ever seen and may shed new light on how the smallest stars are born. Étienne Artigau of Gemini Observatory in Chile; David Lafrenière, René Doyon, Daniel Nadeau, and Jasmin Robert of the University of Montreal; and Loïc Albert of the Canada-France-Hawaii Telescope compared positions in the 2MASS point source catalogue with images from the Digitized Sky Survey. 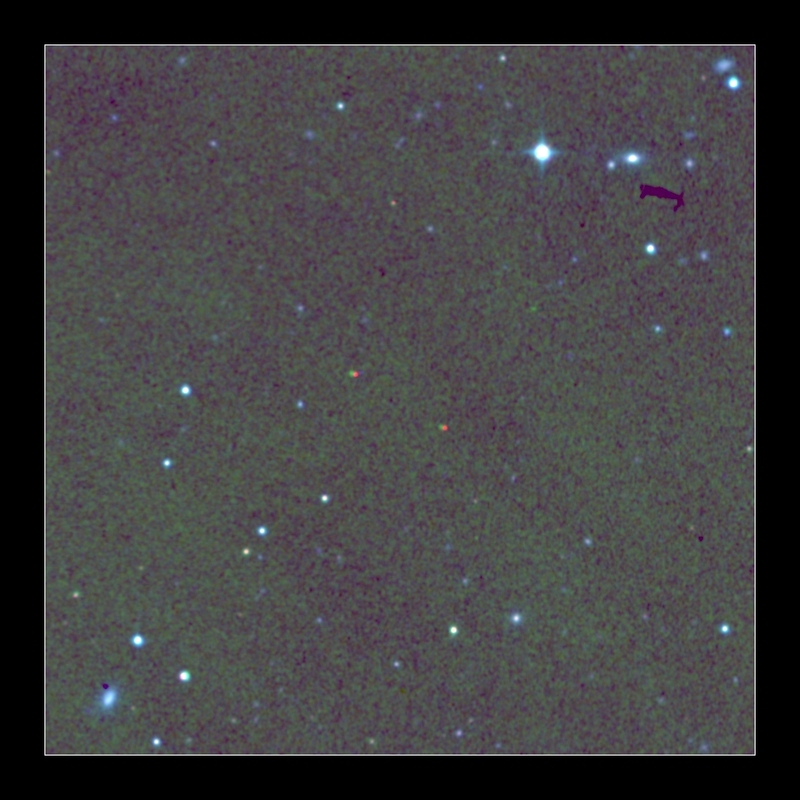 The astronomers discovered two faint stars--named 2MASS J012655.49-502238.8 and 2MASS J012702.83-502321.1--moving across the sky together, despite a separation of 82 arcseconds. Follow-up observations with telescopes in Chile revealed that both stars are much cooler than the Sun. Their spectral types are M6.5 and M8. At visual wavelengths, each star is 22nd magnitude. That's 2.5 million times fainter than the unaided eye can see and more than a thousand times fainter than Pluto. The stars are even fainter than Eris. The stars look so dim both because they emit little light into space and because they are about 200 light-years from Earth. At this distance, their apparent separation translates into a projected separation of 5,100 astronomical units--more than a hundred times the distance between the Sun and Pluto, and a record for a very low mass binary. "I think it's quite intriguing, to say the least," says Ray Jayawardhana at the University of Toronto, "because it's rare to find these wide binary systems, especially in the very low mass regime. And this is the widest one yet--by a lot." Prior to this discovery, astronomers knew of only five very low mass binaries with separations exceeding 50 AU. The previous record holder--Koenigstuhl 1--has a projected separation of 1,800 AU. But the new binary, 2M 0126, is nearly three times wider. The only known binaries that have greater separations also have much more mass, giving them the gravitational strength to hold on to remote stars. For example, the triple Alpha Centauri star system is at least ten times more massive than 2M 0126; as a result, the two main stars of Alpha Centauri maintain their grip on a faint red star located 13,000 AU away. Artigau and colleagues don't know whether the two stars they have found are red dwarfs or brown dwarfs. Red dwarfs generate energy as the Sun does, by converting hydrogen into helium. Brown dwarfs, in contrast, have so little mass--less than 8 percent solar--that they never get hot enough to sustain this nuclear reaction; instead, they cool and fade as they age. Features in the stars' spectra suggest each star is a red dwarf with about 9 percent of the Sun's mass. If so, then the stars are roughly a billion years old. However, if the stars are actually much younger, they could be brown dwarfs that have not yet cooled. In fact, 2M 0126 lies near a group of 30-million-year-old stars in the constellations Tucana and Horologium. If the binary belongs to this group, then models of stellar evolution imply that each star is a brown dwarf with only about 2 percent of the Sun's mass. In either case, the stars have little mass and thus exert little gravitational force. They take at least 800,000 years to revolve around each other. Most scenarios for the formation of low-mass stars have trouble explaining the existence of such a weakly bound binary. Like many long-distance relationships, however, the wide binary is likely to split up. As the stars travel through space, they will eventually encounter giant molecular clouds and individual stars whose gravity will tear them apart--in about a billion years, if the stars are red dwarfs, or in about 200 million years, if they are brown dwarfs. The astronomers will publish their work in Astrophysical Journal Letters. Ken Croswell is an astronomer and the author of Magnificent Universe and Ten Worlds, which devotes a full chapter to each of the ten largest worlds orbiting the Sun: Mercury, Venus, Earth, Mars, Jupiter, Saturn, Uranus, Neptune, Pluto, and Eris.